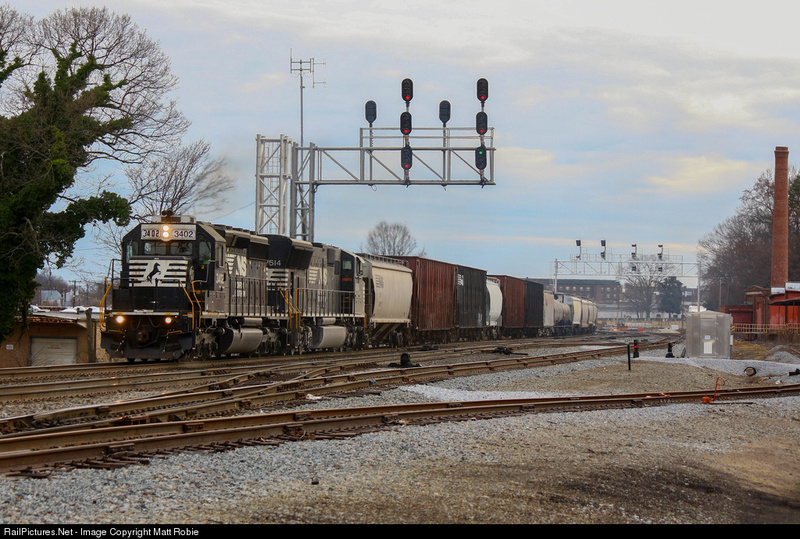 It is already challenging to catch interesting signal indications lit up in the wild, but indications featuring the third, or lowest head on North American three headed signal masts are especially uncommon. Catering to slow speed routes on main line track, the third head is already in a hole since because it is almost a truism that slow speeds are applied to those movements that don't happen very often. Moreover the lower head tends to be employed on oddball combination indications that again, are uncommon by definition. Over the last few months I have collected a sample of interesting indications that use the third head. Here here we see a 1980's Southern style signal gantry in Chattanooga, TN. This one is notable because it features 4 great examples of the Southern's practice of "bottom yellow restricting". The two center heads are pretty straightforward with a yellow lamp on the bottom head that illuminates for Restricting movements into a yard. The two outer signals have a large gap representing a virtual middle signal head to save on costs. 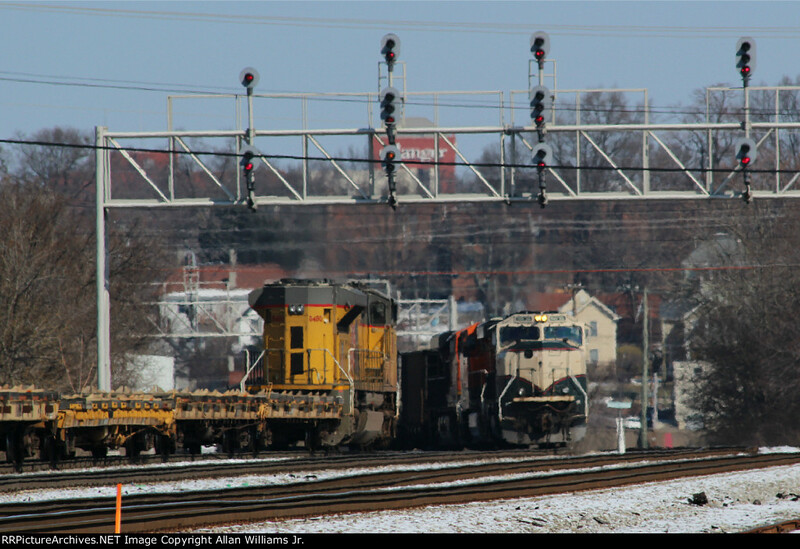 Here the UP #5480 is about to take a R/R/Y Restricting into the yard. Here we see a modern Southern cantilever, but this time the bottom heads contain a full set of R-Y-G lights. The Southern uses a weak route form of signaling and while each head is not associated with any particular speed, the bottom head is typically associated with routes slower than those represented by the middle head. 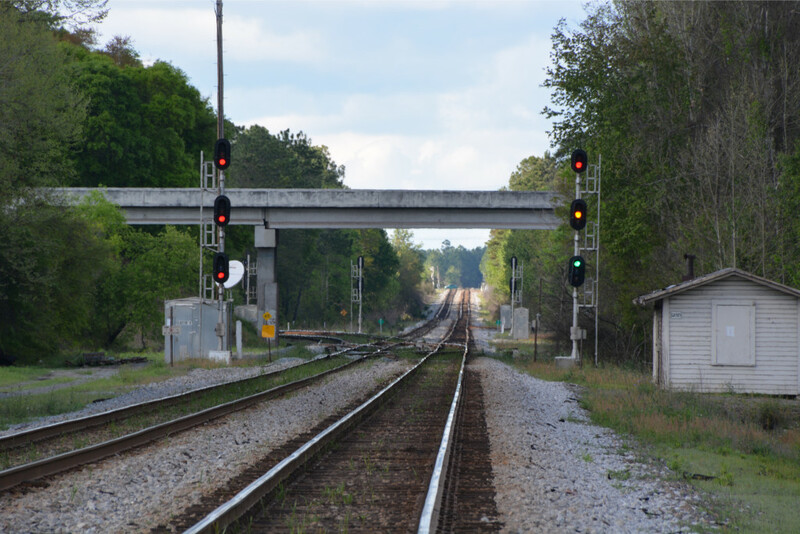 Here at the busy junction in Folkston, GA we see a 3x3 CSX signal using the bottom head to indicate Medium Approach Medium as the 2-track branch to Waycross quickly shrinks to back to a single track one block length away from the junction. Don't let the photo fool you. That lower head is flashing green since under Seaboard rules R/Y/G is still Medium Approach Slow. 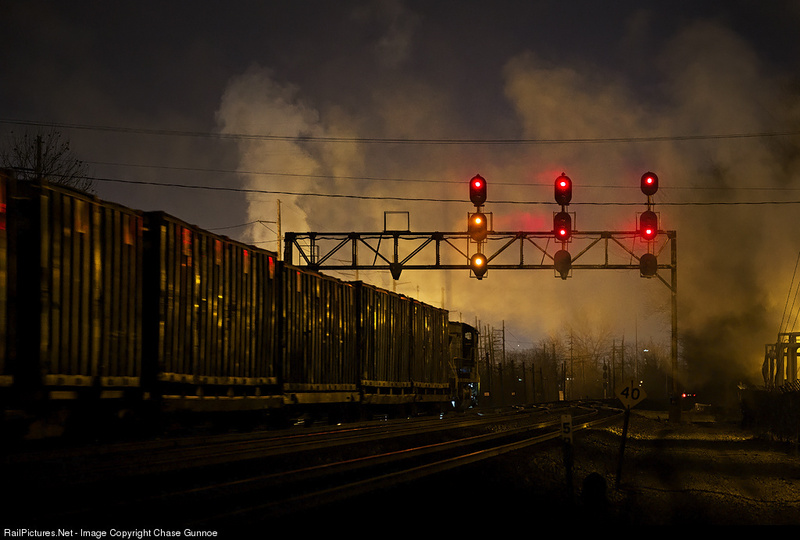 Switching slightly to one of CSX's throwback signaling systems we see a night shot of one of the surviving C&O signal bridges in the Russell, KY complex. Because of R/Y Restricting indications, Medium (or Diverging) Approach indications have often needed to be squeezed in to the aspect chart. Typically this is done with R/Y/R. There is also the less common NORAC approach with R/*Y*. The C&O however took a rather large leap off the reservation by using R/Y/Y for Medium Approach, as seen here.